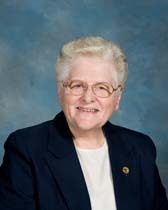 Sister Kathleen Bonawitz, died on December 7, 2018 at Saint Joseph Villa, and was buried in the congregational cemetery on December 13, 2018 following the celebration of the Mass of Christian Burial by Reverend Bob Mulligan, OSFS. Her Uncle Joe, her father’s priest brother, and the Sisters of Saint Joseph at Little Flower High School encouraged and confirmed her ideas about her vocation. Her father thought it would be a good idea for her to wait a year or two, which she did. Originally, she was going to work for the FBI, but by the time everything was finalized, she worked instead for a bank, the only “girl” on staff. After her two year stint in the banking world, Kathleen entered the Congregation and following her time in the novitiate, her professional focus was on education. Her mission of teaching took her to Philadelphia, Delaware and Washington, D.C., serving for 13 years in elementary schools and 23 years in high schools. One of her more exciting experiences involved her time at Holy Name Convent in Washington. It was 1968, a time of great political unrest; riots broke out in the city and a thousand troops were stationed right across from the convent. She and others had to be escorted to the convent by a “soldier who actually rode with her, his rifle drawn, looking in every direction.” Exciting indeed! Only her love for her family superseded Kathleen’s love for her friends and co-workers. Her sister Carol had died a number of years earlier, and it was a priority for her to remain in close touch with Carol’s children. And she talked with her sister, Betty, every day, visiting her often, spending weekends with her at their home in Wildwood Crest. After Betty’s husband Leo died, Kathleen went with her sister to visit Leo’s extended family in Florida. And thus began Kathleen’s complete fascination with Disney World. When she visited family, she also visited Disney World. When possible she visited the Magic Kingdom with friends. The place was an absolute delight to her. She was supposed to go again with Betty in January. Although that never happened, she is instead in the kingdom that goes way beyond the magic of Disney, one she that she has been preparing for all her life. We are grateful for Kathleen’s goodness and kindness. We pray she is enjoying the peace, the joy and the endless delights of her Father’s kingdom.